I worked with Dave Donelson years ago, long before he wrote his first novel, Heart of Diamonds. His connection with the media business is apparent in the development of the story and principal characters in his book. This is the type of novel that you may pick up now knowing what to expect, with no nation al reviews and no best seller listing. Had the author not handed me this book on a chance meeting, it would likely have not come to my attention. I am glad that it did! Here is the list of ingredients for this extremely fast paced thriller! A beautiful female network reporter who is passed over for the coveted anchor chair, complicated by the fact that she is the girl friend of the network’s Washington News Bureau Chief. A war-torn African Republic of the Congo ruled by your typical despot. A young and handsome doctor who has eschewed a prestigious NYC hospital assignment for a clinic serving the malnourished who are also victims of the violence among the warring Congo factions. A diamond mine in the Congo owned by a famous television evangelist who is a public supporter of the President of the United States, and who through an elaborate scheme, is skimming the diamond mine’s profits without the knowledge of his partner, the despotic president of the Congo Republic! You guessed correctly if you placed Valeria Grey, seeking a big story to offset her disappointment over losing the anchor chair to a male talking head, literally in the middle of this complex mix of violence, subterfuge, death, and high stakes potential political fall-out. Could the President of the United States be so foolish as to become involved in the scheme? It certainly becomes a life and death struggle for Valerie Grey and those who seek to support her exposing this incredible blockbuster story! 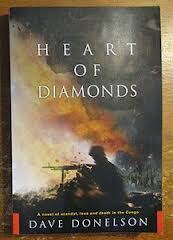 As I referenced earlier, Heart of Diamonds was a surprise which I opened and completed in a day and a half. Alarmingly insightful and an enjoyable page turner indeed!